Forest Manor is a stylish and private holiday home located next to the beautiful and world renowned mountain bike and leisure area of the Redwood Forest, and 5 minutes from town. 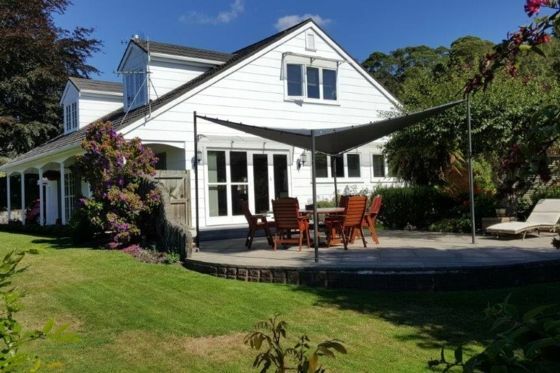 Let this high class oasis be your retreat - as well as your convenient base for exploring Rotorua’s many amazing attractions. The home is warm and sunny with great indoor/outdoor flow. Enjoy the landscaped outdoor terrace which is accessed directly from the main living space. The terrace is perfect for outdoor dining, or simply relaxing and enjoying great company in nature. This private residence easily accommodates up to 12 guests and offers a modern granite benched fully equipped kitchen and scullery incorporated into an open plan living area with a fire. Adjoining this is a dining area and second living area. Technology includes 4 T.V.’s and a central audio system which may be piped through the residence, Wi-Fi and a smart TV. Heating and Keeping Cool is covered as the home is fully insulated and double glazed as well as boasting 3 heat pumps, a fire and a heat transfer system. There is under-floor heating in the beautifully appointed tiled bathrooms as well as heaters. Internal access garaging is provided as well as off street parking. There is a tennis club and children’s playground across the road and the home is located in a quiet cul-de-sac in one of the best streets in Rotorua. A shopping centre with good cafes, eateries, shops, liquor store, etc, is located 2km from the Manor. Blue lake reserve is 6 km away and the CBD is 4km away. Tea and Coffee, Light refreshments, and Snacks Provided. We welcome guests to our beautiful home, we are very family friendly and endeavour to make your experience and beautiful and welcoming as possible. Please be aware that we have a no party policy. This is a high class property in one of the bets parts of Rotorua. Take the opportunity to add some luxury to your holiday. Love it. The house is tidy and clean and the garden is beautiful. Well equipped family house and kids friendly. A lot space inside and outside the house. Assorted cooking equipments and geeks like home while away from home. Keep it clean if u are planning to stay. Thanks Tracy and Stephen! We loved this home, plenty of space for the kids to run around- and breakout spaces for people to have their own 'space'. Was fantastic to have things on hand such as washing powder, shower gel and shampoo. The house was very clean and tidy. We read the reviews and made sure we brought a bodum for coffee. Would be great to have one of these here, scissors and cheese grater :) Loved our time with family from overseas. Terrific property, thanks Stephen. It was nice to stay in an exceptionally clean house with plenty of linen and more than enough kitchen equipment, cutlery etc. Great location and we thoroughly enjoyed sitting in the very beautiful garden. I'd definitely recommend this property. Beautiful home and property. Great place to stay! Beautiful home great layout for multiple families/ large group. Loved having the forest trails across the road and the playground was a hit for the kids.